TRMK - Mortal Kombat News - Next Mortal Kombat To Be Revealed in PSM3 Issue 128? Next Mortal Kombat To Be Revealed in PSM3 Issue 128? Immediately to the right of the tease is an image of a feather and a distinct MK-like red blood drop. The feather could be a clue of the PS3 exclusive The Last Guardian in which one of the main characters is a "giant, feathered creature." As this game is PS3 only, it would serve as a tease for the first point in the bulleted list. The blood drop we're hoping to represent the 9th Mortal Kombat game, which will not be PS3 exclusive and would fit into the 4th bullet point that we quoted above. 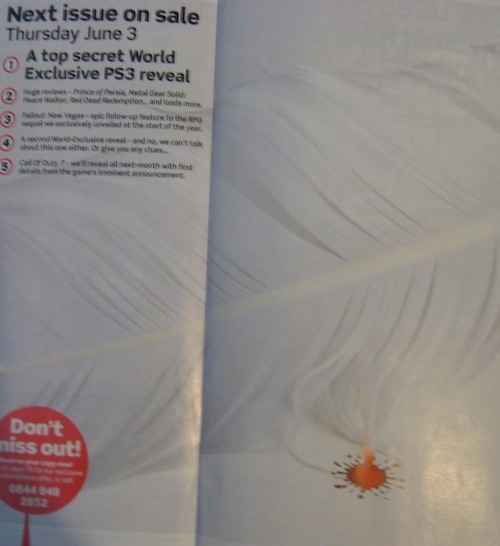 Also WB Games does seems to have a good relationship with PSM3, as they were the magazine to reveal WB Game's F.E.A.R. 3 last month. If this is true, it's very possible other magazines around the world will also have similar exclusives. So stay tuned as we hopefully will find out more next month! Thanks to SWORDF1SH over at Game Trailers Forums for first reporting the scan, and TRMK Forum member pebkac for the heads up. Update 5/26: According to PSM the multi-platform reveal was the recently leaked Assassin's Creed Brotherhood. It was a far fetched guess, but sadly didn't pan out. Thanks Skillz for alerting us. Just make sure to tell us when this mag hits shelves because I have to have it. When do magazines usually come out each month? A little vague. I would have never gotten MK out of this one. If anything, the blood and feather thing makes me think of Assassin's Creed. I'l have a look on June the 3rd and post, being one of perhaps two british people on the forums. Yeah, that drop of blood could be anything. But it's still news, sorta. So June 3rd where? The states or everywhere? It's a UK magazine. Don't worry, I work in a shop that sells it, I'll tell you guys as soon as I see it, and if it is indeed MK9, I'll buy the mag and retype what it says, like I did when The Flash was unveiled in a UK mag. You guys are like the tabloids of video games. I bet it's gonna be Killer Instinct 3. You guys are like the tabloids of video games. Considering the lack of news, inventing news is better then nothing... Lol. Edit: If you think a drop of blood is a hint of MKness, I hate to see what you'd say at a rotting corpse. What ever those games are, I hope they're good and I hope one of them is the next MK. This guy is claiming to have the June 2010 Issue of PSM3? Does anyone know if this is the May 2010 Issue or infact the June Issue? Has no MK anything on it. http://cgi.ebay.com/PSM3-MAGAZINE-ISSUE-127-JUNE-2010-NEW-SEALED-2-GIFTS-/270575166173?cmd=ViewItem&pt=UK_Magazines&hash=item3eff8962dd Yea, I figured so. The June 2010 PSM3 Magazine doesn't contain any info, pics or anything on MK9...lol... http://www.computerandvideogames.com/article.php?id=245518 Sorry Guys! Serious KK, you sent me this in five different places and then posted it here, do some research or just email me it and let me do some research on it. THAT issue you posted info to is on sale as of this week, this is the issue that has the teaser for the next issue to go on sale in June. Read the picture above "ON SALE JUNE 3rd" subscribers should get it a week or two before then. I'll correct the story to say the proper issue #. Ok, My apologies, Sorry to get you upset. The drop of blood can be the new Square Enix game "Nier". It does have blood in it. I'm not sure if the drop of blood means that though. I'm just guessing. Well, it says 'World-Exclusive Reveal', so chances are it just might be a reveal of a game that's world-exclusive. Nier and Deadliest Warrior wouldn't fall into that category as they've been kicking about for ages. Well I'm curious about what it actually is now. Since we're pretty sure it's not MK at this point. I don't think this should have been posted as news. It's WAY too vague. That explains the feather, figured that once they game info started to leak around. Well now to wait for the next possible reveal from another magazine, it can't be too far away by now. lol^^ but this isn't a suprise, the chances were already slim. Let's wait and see..like Patrick McCarron said..there might be an other magazine reveal. I hate to say I told you so but... Nah I'm lying, I love it. That would be awesome. I hope we see finaly at E3 some stuff of MK9.